There’s a new coffee brewer vying for attention on the internet, but without an $11,000 price tag, this one has received much less fanfare. The Impress, a stainless steel AeroPress-like contraption, is the latest coffee product to raise production costs through pre-orders on Kickstarter. The campaign will have most likely reached its $50,000 goal by the time you read this post—with 25 days remaining. 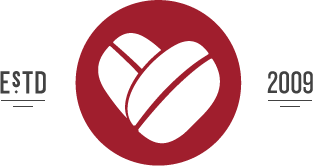 This latest attempt to improve how we brew coffee comes from Raleigh-based Gamil Design. 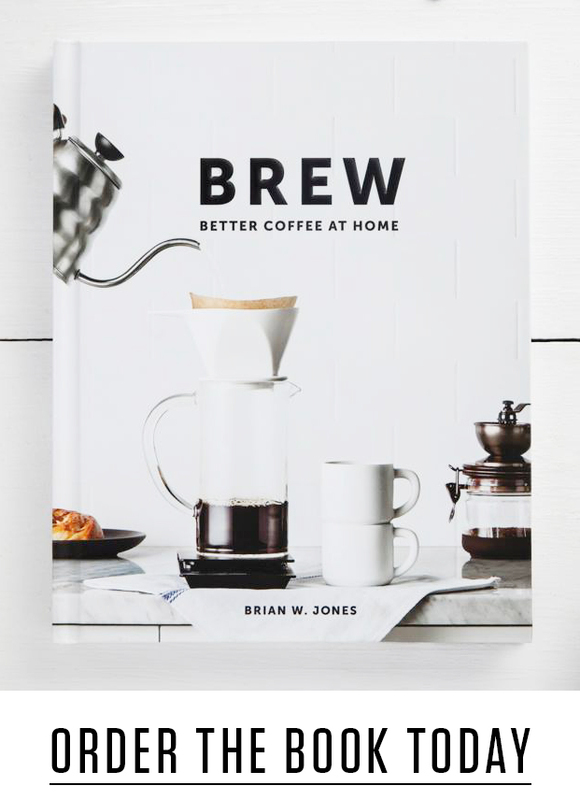 The husband and wife led design team have taken elements from several brew methods to create a simple and streamlined product with curiosity inducing potential. The primary concept is based on full immersion brewers like the French press and Eva Solo—pour in hot water, ground coffee and steep—but the Impress utilizes a new way of separating the grounds from the water. 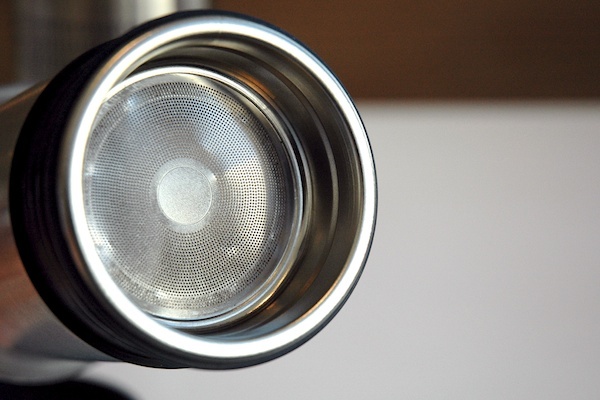 It uses a plunger like contraption resembling one from an AeroPress, with an inverted portafilter basket attached to the bottom. After the proper amount of time has passed (3-4 min), pushing down on the plunger will draw the coffee through the microfilter, while trapping the grounds at the bottom. 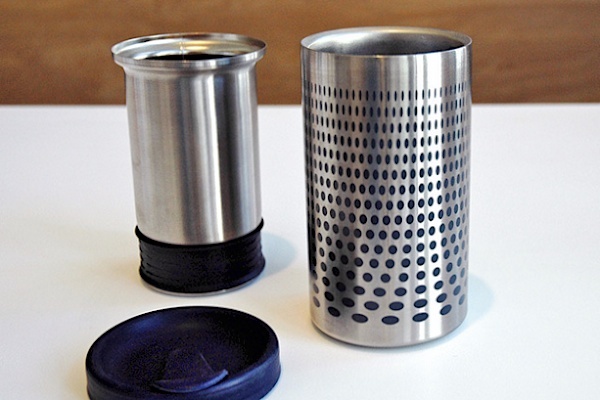 The tight seal of the plunger combined with the more precise holes in the metal filter, are designed to allow far less sediment through than a French press (an AeroPress using a Disk filter comes to mind). Once the plunger has been pressed all the way down, the Impress becomes a 12oz travel mug that carries your freshly brewed coffee. 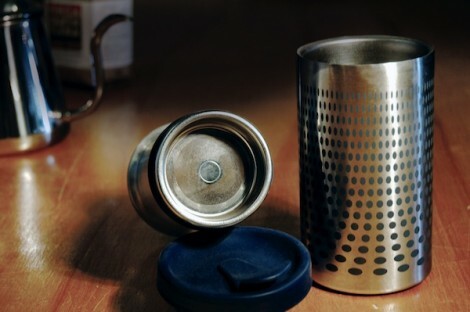 While my immediate thought was the over extraction that would occur from continuous steeping, the designers claim that it’s virtually nonexistent because of a much more prominent barrier created between the coffee and extracted grounds than what you find in a French press—if nothing else, the affect is most likely reduced a fair amount. The double-walled exterior, combined with the steel plunger create 3 walls of insulation that’s sure to keep your coffee temperature stable and offers an attractive new coffee brewing option for traveling and camping (although its current design can’t be used to boil water). The designers experimented with a version that worked with interchangeable filter baskets, including VST baskets, but ultimately decided to use a proprietary filter design that screws in place for added durability while plunging. Without having tested the Impress, it’s hard to say how well it brews a cup of coffee, but the idea was intriguing enough to support and I look forward to giving it a try. I’m disappointed in this review. It honestly sounds suspiciously positive about a product that has very little going for it. You say “an AeroPress using a Disk filter comes to mind”. Comes to mind? It’s the Exact. Same. Thing. The only thing differentiating this product is the fact that it’s also a 12 ounce travel mug. But, in order to also be a travel mug, it keeps the grounds in the cup the whole time. That’s 1.) gross and 2.) a horrible idea. There’s no way the filter at the bottom is going to keep the water away from the grounds. The filter is *made* to let the water through,. That’s the whole point. Is it as bad as if the grounds were just floating around? No… but it still can’t be good. Also, the fact that it’s built into a travel mug is actually a drawback even if the grounds weren’t a problem – it means you’re stuck using that exact mug and limited to 12 ounces of coffee. I can’t imagine ever buying this instead of an aeropress. It’s blatant rip off, with an added feature that is almost entirely negative. Not that you posted a glowing review or anything, and I know you touched on a bunch of these points, but the tone of the article made it sound like you were doing your best to post a positive review for a product about which you couldn’t really find much to like. Why is that? Why not just say what you know to be true – this is a bad product that doesn’t solve any problems. If I thought it was a terrible project, I wouldn’t have pre-ordered one for myself. Pretty much every one of your arguments above are misguided or blatantly dishonest. 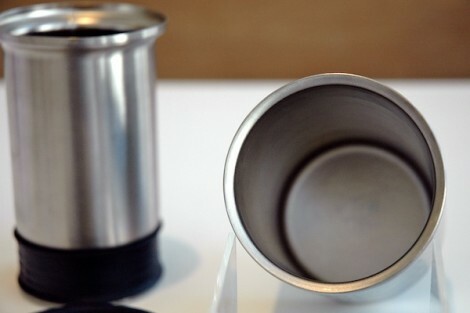 For starters, if your biggest complaint is that it’s a “rip-off” of the AeroPress (which it most definitely isn’t)—you must hate the V60, Beehouse and Kalita too, for replicating what the Melitta already did—filter coffee through a cone. The Impress doesn’t use pressure in the same way as an AeroPress and more closely resembles a French press, not only in steep time, but in the way it separates the grounds. If you’re going to criticize something’s function, at least gain a better understanding of how it actually works. As I said, I’m not convinced this will completely stop extraction if left to sit, but a lesson in physics will tell you that with the type of filter the Impress uses, the cross flow won’t be as generous as it would be in a French press. If you fill a portafilter with water, it will retain some of that water if there’s no pressure forcing it through. So while it may not stop extraction completely, there’s a very high probability that it will be decreased a fair amount. 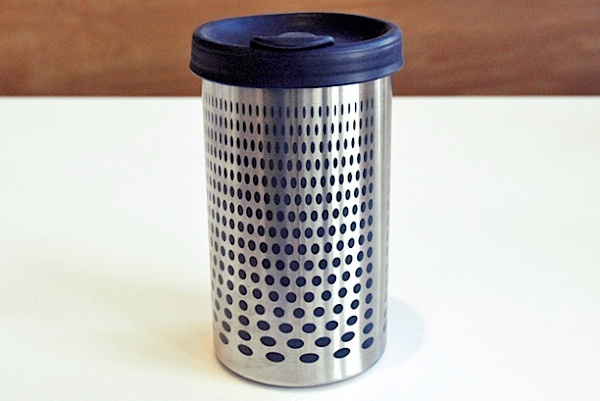 Just because the thing comes with a lid doesn’t mean you need to use it as a travel mug, just decant into your own cup and take a deep breath. 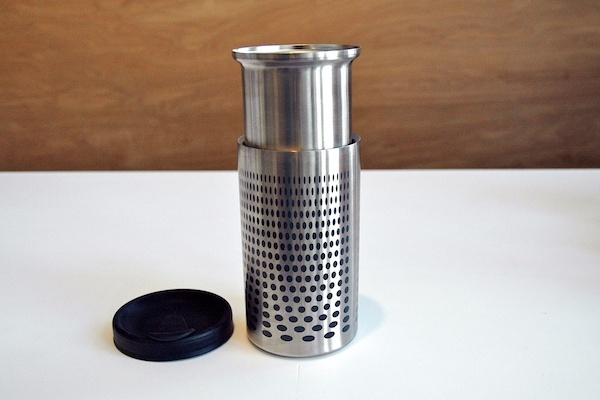 If you couldn’t imagine buying this over an AeroPress—then don’t. I would like to see some in depth reviews once it’s shipped. The allure of an all-in-one device is definitely appealing for a coffee aficionado on the go. Thanks for posting this Brian!